Progress has been a little slow this month, not much free time. Nevertheless one more bulkhead has been fitted. 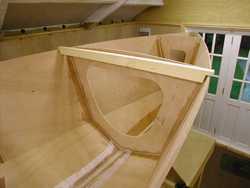 The picture shows the shere spreader beam still in place and the sole fillet progressing from stem to stern.